The pattern printed on the coffee pot is shown here on a 7.5 inch plate with an impressed ROGERS mark. A large earthenware coffee pot printed in blue in the Toy Chinamen pattern. This pattern is found on tea and coffee wares. A teapot with an impressed "ROGERS" mark is known. 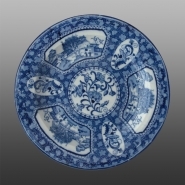 The pattern consists of two small Chinese figures, one with an umbrella, a small dog, trees and buildings. In the case of the coffee pot, this miniature framed pattern is repeated on the neck and on the lower half of the pot. An additional leaf and scroll design is found in oval-shaped panels and on the pedestal base and lid. All of these design elements are framed by an overall chintz-type pattern. The impressed mark above is also found on the plate which is included as an additional example.